Bin collections will take place as usual over the Easter bank holiday. This page provides information on the composting process and how to get a composting bin. You can get your composter, and other ‘green’ products such as water butts, from the Get Composting website. Now on offer at buy one and get one half price. The best compost is made with a mixture of ‘green’ and ‘brown’ materials. Find out more on the Recycle Now website. Green material will help provide nutrients to your plants. Brown material will help the structure of the soil. It’s important to get lots of air into your compost, scrunched up paper and card will help create air pockets and help keep your compost healthy. A food waste digester can be filled with kitchen waste such as bones, meat, fish, bread, rice, cake and food that will break down. 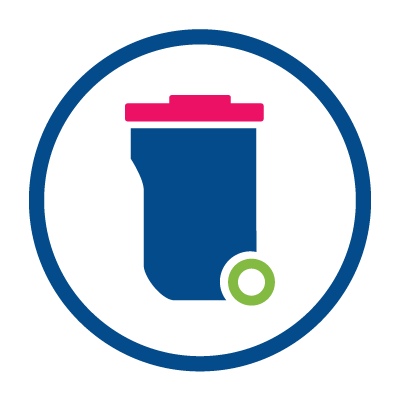 They offer an environmentally friendly way to dispose of your food waste while producing a high quality, organic compost or liquid feed as an added benefit for your garden. The Green Johanna (330 litre) is designed to sit in a shady part of the garden. The temperature inside remains higher than the outside temperature. You can put all cooked and uncooked food waste, as well as a proportion of your garden waste (one part garden waste, two parts food is the ideal mix). It produces rich compost in 4-6 months which can be used in the garden. The Green Cone (80 litre) is designed to sit in a sunny position throughout the year on well-drained earth and needs to be dug into the garden. You can put all cooked and uncooked food waste into the underground digestion chamber, but not garden waste. The food degrades below the ground level, reducing the contents to their natural components of water and carbon dioxide. These seep out into the surrounding garden and soil, therefore acting as a natural, liquid fertiliser for your garden. The Green Johanna - £79.99 – Inc VAT and free delivery (recommend retail price £119.99). Includes digester, assembly instructions and guide to composting booklet. The Green Cone - £66.66 Inc VAT and free delivery (recommend retail price £99.99). Includes digester, assembly instruction, free kitchen caddy, accelerator powder and shaker and DVD – An Introduction to Food Waste Digesters. You can buy one directly from Great Green Systems either online or by ringing 0800 013 1304.